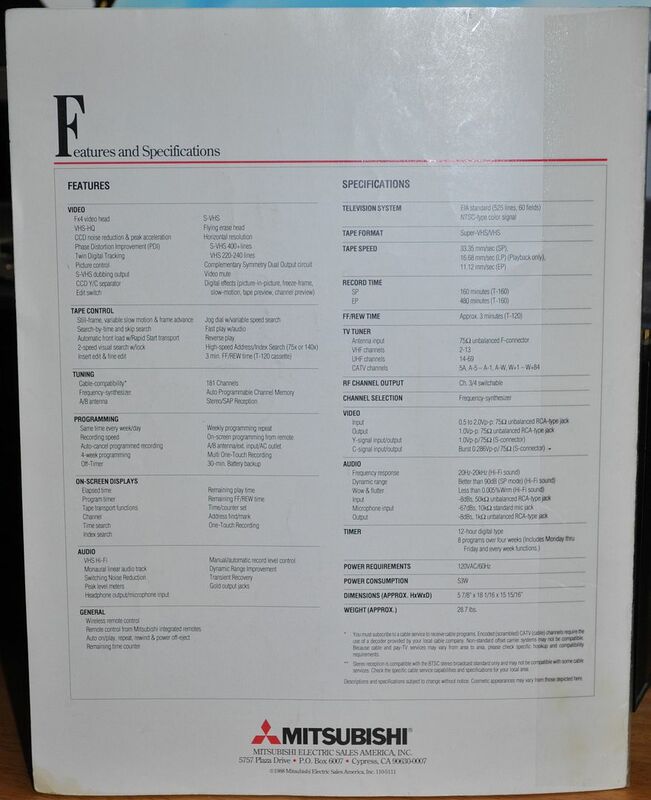 LaserDisc Database • View topic - Laserdisc Player Resurrection Crowdfunding Project, ANYONE? 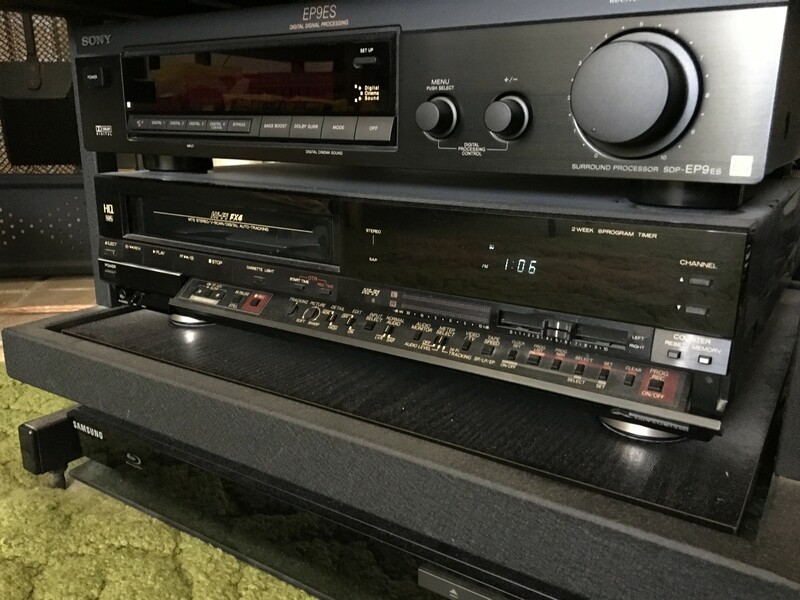 Laserdisc Player Resurrection Crowdfunding Project, ANYONE? The BD player only is not on the rack ! I ran out of space so I had no choice but to put the Blu-Ray player on the floor. However, it's sitting on two pieces of glass so it's not really touching the carpet that it sits on. I think that bottom Sony (with front AV inputs) was definitely only made for the Japanese market. I have to agree, a lot of the Sony high end machines were amazing looking. Not sure how they perform but of the only one I ever owned (an MDP-455), I was disappointed in its reliability. Amen!!! 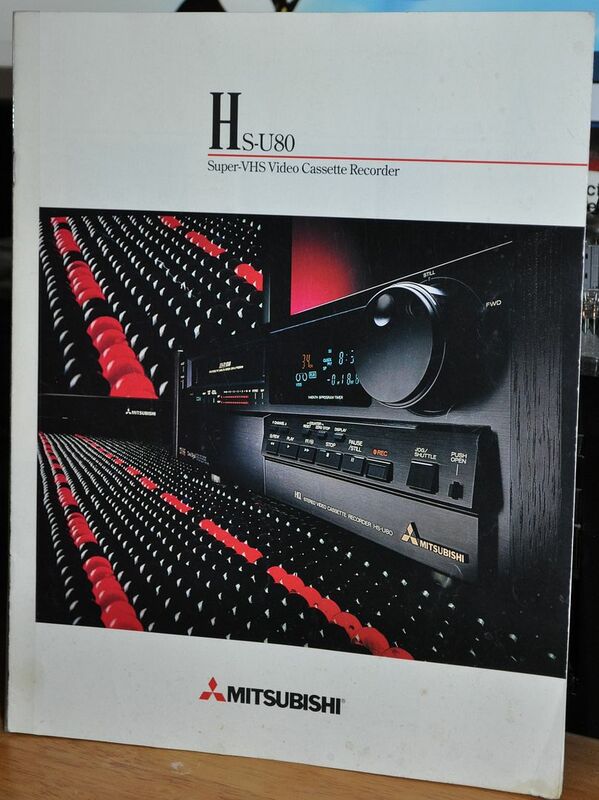 i see you've got an MITSUBISHI HS-U80 S-VHS as well!! one of the best-built VHS decks ever made. Yep. One of my faves from my day selling Consumer Electronics in the late 80's. I picked this one up used when I was working @ The Good Guys! in the early 90's. It had problems but I eventually fixed them all. Now it's just a glorified water cooler piece that gets rarely used but I still like keeping it around. Probably have to rewind and ff a tape soon to keep the belts fresh. I think we might be like twins since you own a CLD-3030 and a CT-S800 just like me (my 800 is currently boxed due to worn belts but I'm going to eventually work on fixing that). 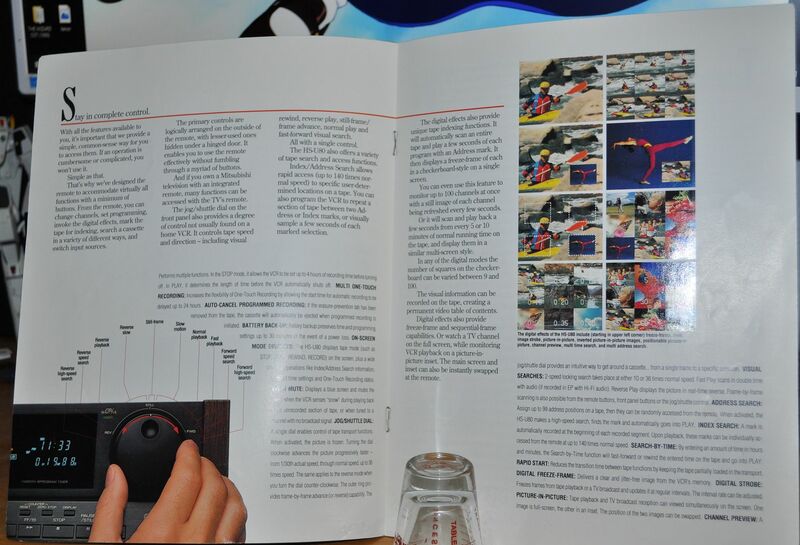 BTW, I noticed you have the original brochure for the U80. Any chance of getting a scan of that? i can manage this much, anyway. 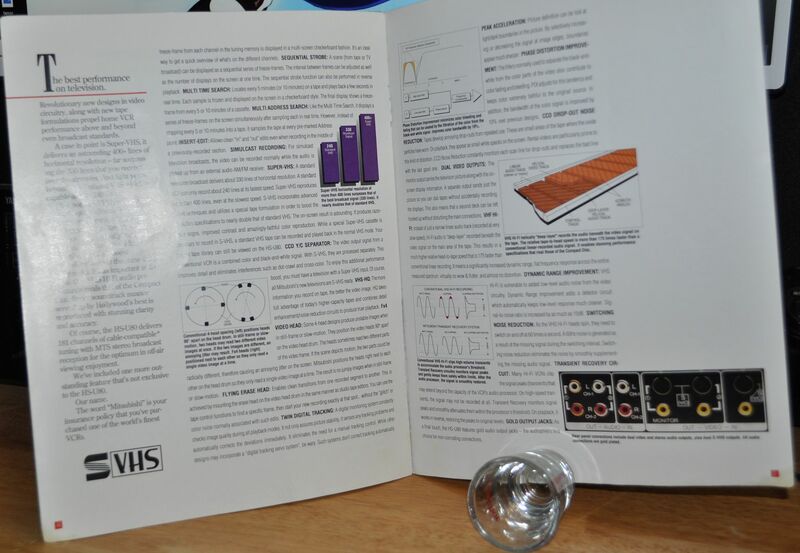 not the most exciting product brochure ever printed. Thanks for getting this much out. It’s about the same approach they had with the brochure that covered the U20 - U70 models. I kind of like the style because they really try to explain why their product (in their opinion) was better than the competition. I still kept a number of spare Mits VCR’s from this era for spare parts. I appreciate the diversity of some of these companies in the 90's. In Australia Mitsubishi was basically only known as a manufacturer of cars. but neither of them work. the U80, however, is a diehard to this day, and at $1700.00 MSRP in it's day, it darned well ought to be. 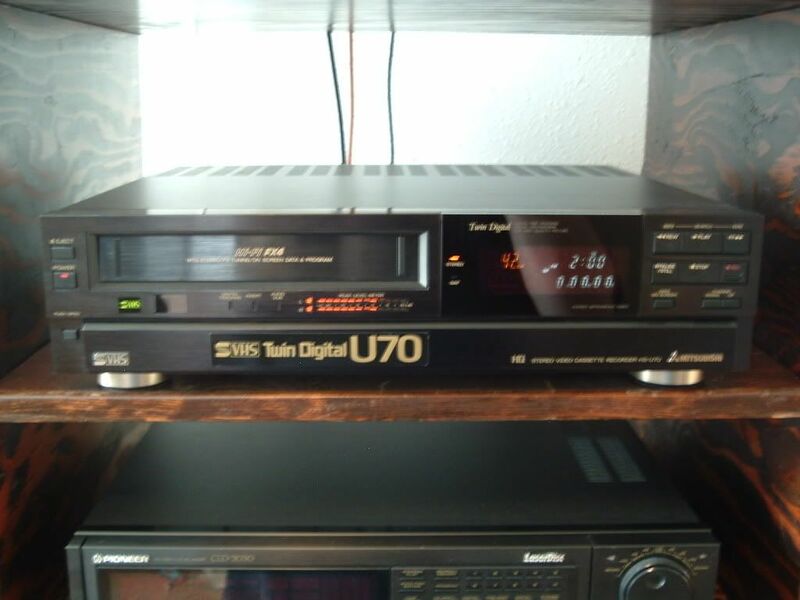 even so, the HS-U70 was, in fact, the very first drop-dead-gorgeous-gotta-have-it high-end VCR i ever saw in my life. and they allowed me to take photos. So what happened to our original poster?? I think the problem with Digital VHS is that DVCAM was superior and it Digital VHS was too little too late. 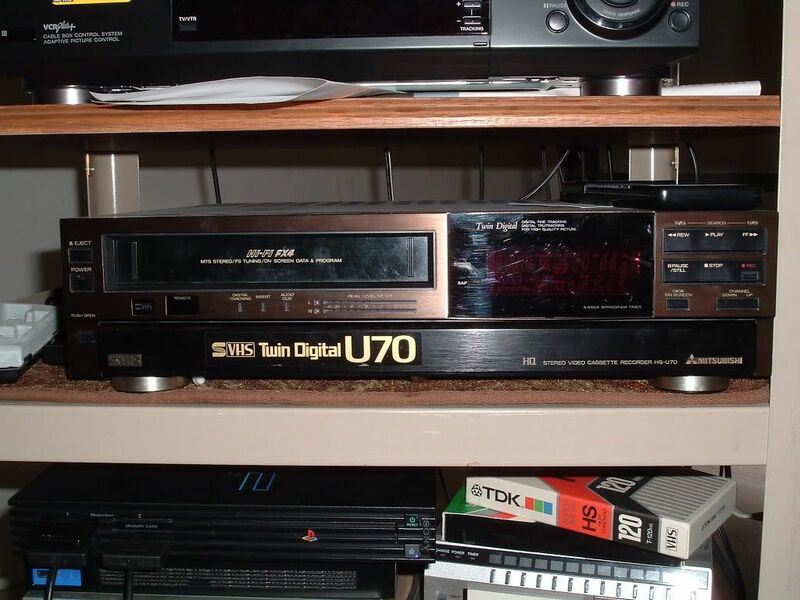 Here's the VCR that was my favorite before the U80 stepped into my life (I still like it no less, of course ). 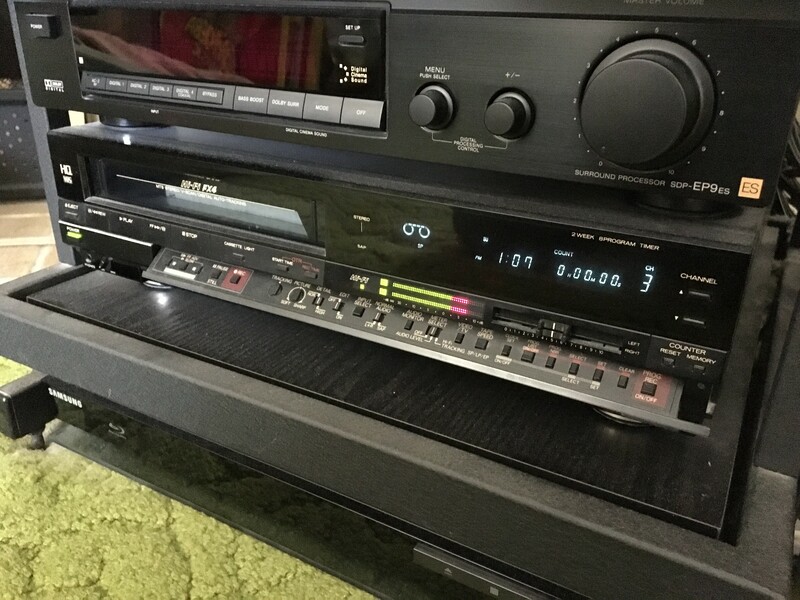 This is a Mitsubishi, HS-422UR, 4 head VHS HiFi unit that is actually a direct descendant of the U70 by two years. 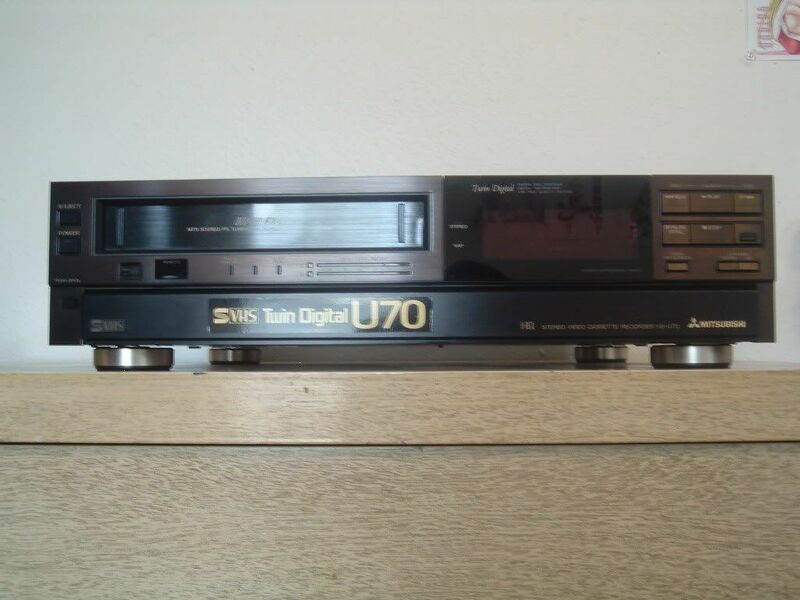 It was the predecessor to the HS-423UR which was the first S-VHS VCR by Mitsubishi. This picture shows the panel door that hides the extra control buttons (the buttons angle down w/ the door). The cool thing about this unit that is unique and has never been implemented ever since is a "cassette light" that utilizes two mirrors to provides a view of the top side of the cassette to see how much tape was physically left . Since then, all newer VCRs' had more sophisticated electronics to provide info on remaining tape. Finally, a last image showing how it looks w/ the VU meters on and other displays. Last edited by ldfan on 10 Sep 2018, 08:06, edited 4 times in total. Nice EP9ES also. I just got one a couple of months back, cleaned up my cable situation well and does a really nice job as a pre amp. Just wish it didn't put out so much heat. 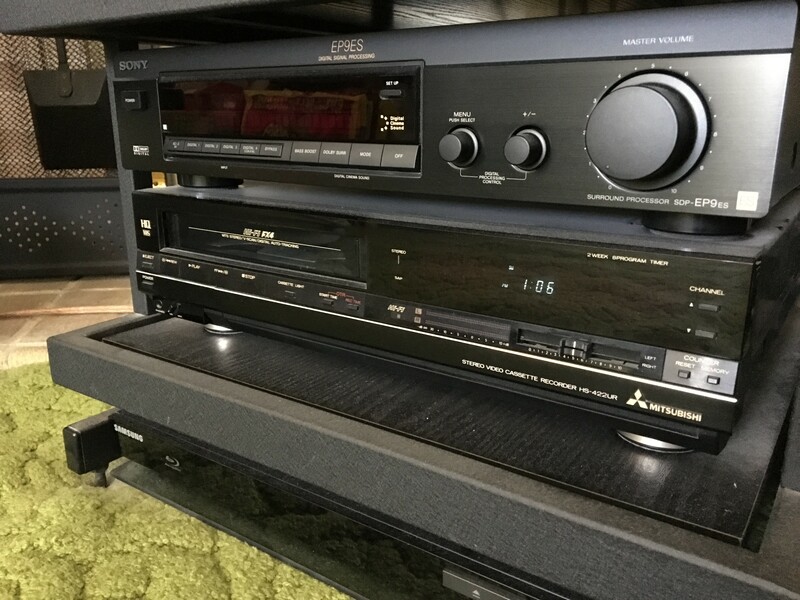 it is certainly a RARE one, at least in the U.S.
for MITSUBISHI and other choice makes of VCRs for a solid 15 years now. Come to think of it, you're probably right. Just recalled that when it was released in 1987, it was an odd half year release so it stayed on the market a lot shorter than most production runs. In fact, there was never an official brochure released for it from what I recall. I think part of the reason for the short release time was because of the introduction of S-VHS so they ended it early for the HS-423UR. It actually needs some minor work. I had its head replaced some years ago and it has never really been the same. I inquired w/ a repair shop on why I had issues making a good recording on it and they said that it was critical to get an original Mitsubishi head instead of an aftermarket unit. I do have an OEM head that I pulled off of an HS-411UR that will be used later to fix this issue. Otherwise, mechanically she works great still. I also had some minor cold solder issues w/ the tuner awhile back as well and fixed that but it doesn't really matter now since we can't record analog OTA or Cable anymore. Yeah. My unit heats up quite a bit as well but I find it's more manageable vs. its lower cost cousin the SDP-E800. The E-800 is so odd in that there are no vents on the sides or top of the case and it literally traps the heat in (at least the EP9 will let the heat escape). I'm currently working on an exhaust fan mod for the E800 to just simply create air flow and that should help reduce the heat issue. I'll post about it once I get it done. 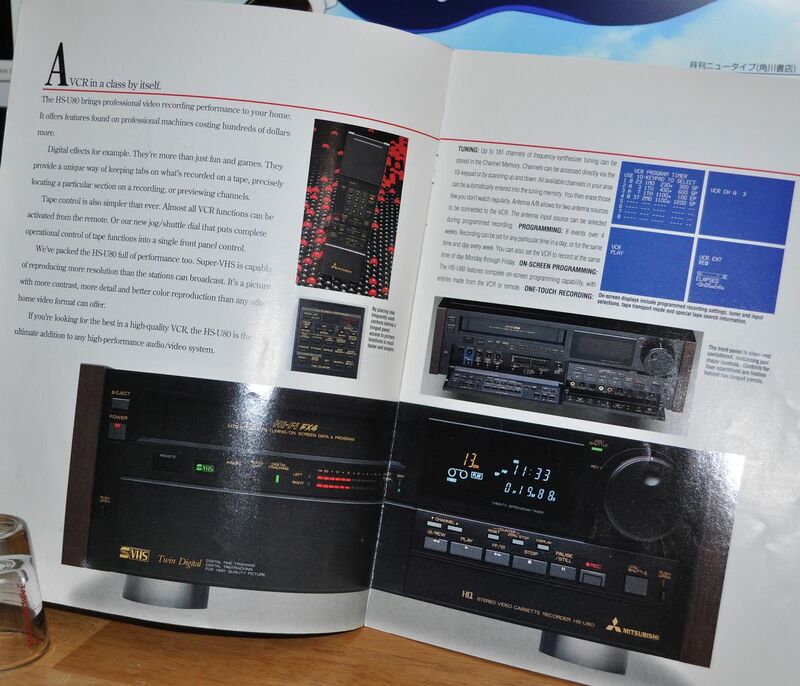 A few years ago we picked up one of those all in one CD, cassette, radio, turntable players. It was about $75 if I remember correctly and really more of a novelty but it did allow me to revive my interest in records, especially the old 78 rpms that my grandmother had. If these are possible then I'd like to believe that a DVD, VHS, laserdisc, Blu-ray combo player might show up on the shelf of a variety store someday. I know I would pick up one or two for the house and man cave. At least I can dream right? Again we're just covering ground that's already been talked about. What you got there is a piece of junk pretending it's hi-fi, but what I'm talking about is the fact that it doesn't contain anything that isn't still in production for other, much better systems. They still make CD players, radios, turntables and even cassette decks of varying quality to this day so it's a simple matter of shoving them all into one box and using the cheapest components so it's a pile of cheap garbage, whereas laserdisc is an obsolete media because both the manufacturing plants and even the equipment to make them are long gone and requires actual high-end hardware to even work. Making a blu-ray player that can play DVDs is relatively simple because they're both digital and all they really are is a collection of files that the player can interpret as video, audio and the interactive content (ie. menus) along with some root sector trickeryt for copy protection and whatnot, whereas making a blu-ray combo player that could play laserdisc would be almost like making a dvd player that can play 33rpm records, sure the reading mechanism is similar since they're both read with a laser, but the way they're actually recorded is completely different so you'd need dedicated hardware for it just as much as you'd need it for VHS. That’s a good analogy. A combo DVD record player...it really is that disparate, the difference between LD and virtually all other optical disc formats. It only seems so easy when you don’t know anything about any of the componats you’re trying to intigrate. 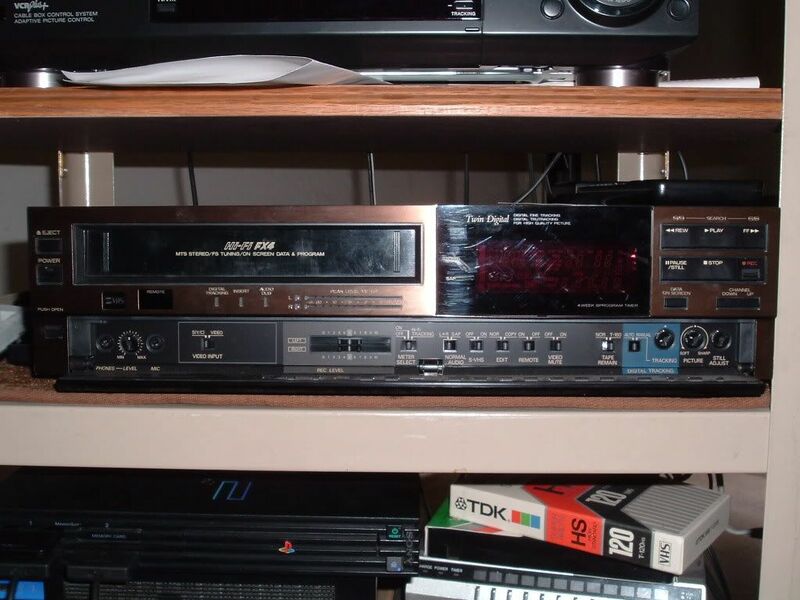 In reality a decent BR player is less than $100 so the “combo” for the forseable future will be just buying a cheap Sony and setting it on top of your LD player, your VCR, Viewmasterx etc, kind of like how we would put our real to real machines next to our turntables back in the day. Intigration always comes with compromises anyway (the calander on my wall, honestly, is way better for my purposes than iOS’s Calander, the 100VAC outlet in my car can’t produce the current the sockets in my house do, etc) and making any LD player at all is so unrealistic and expensive that one wonders why anyone would care if it did such a plain and basic thing as play Blurays. It would add more to the cost than just buying a standalone player from a company that actually is good at that (probably Sony). As long as we are all playing what if? 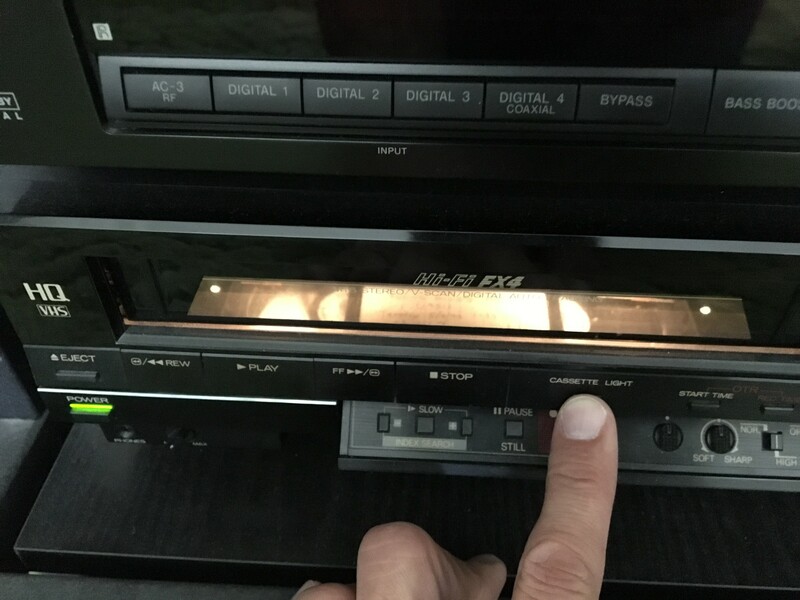 ... what if instead of trying to create a player we instead took an entirely different approach & just created a device that was able to read & measure all the pits & falls effectively "backing up" the Laserdisc? I assume at a much lower rotation speed and then used a software emulator to read it back & play it? Wouldn't that vastly reduce the complexity of the hardware? I'm not talking about a high-quality player for the serious technophiles. I'm talking about something that'll play that odd disc that you find at a Goodwill or yard sale. Maybe even a whole box you found in Uncle Bob's backroom. It would be strictly a novelty item and a little nostalgic. So make it out of less than high quality parts and add a cheap come filter with an HDMI output so that it can be plugged into today's TVs. Needs to be cheap so people will buy it the serious collectors will stick with the Vintage machines. Like you said we're just playing what if, but I seen stranger things. Just fun to speculate. I Would welcome a Laserdisc Comeback.....Period!